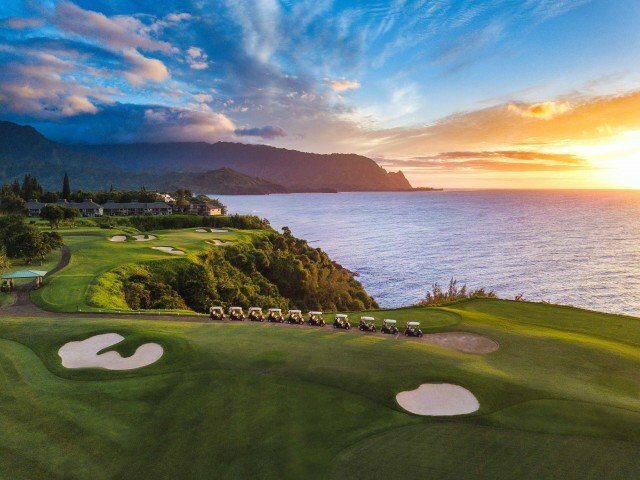 As sunset nears, the last stop is at Hole 7 where many months out of the year guests will watch as the sun sinks directly into the Pacific Ocean with a view of Makana Mountain, better known as Bali Hai. If one is lucky enough to have a clear horizon, a green flash is even possible! “My husband and I did a sunset golf cart tour here. The tour was awesome – golf cart was comfortable and modern, tour guide was friendly and funny (Andrew), and the views were awesome. We did not play golf on the course, but my husband is a golfer. He thought the course was very well maintained! Check-in is two hours prior to sunset. No outside food or beverage permitted. Two ice cold waters per cart are provided. Maximum two riders per cart. Call (808) 826-1912, ext 200 or 201 for more information. For more of my blogs or to subscribe, go to the right hand side of this page (full screen computers). To find out more about our luxury, three bedroom vacation rental in Princeville, go to any other page of this website. Mahalo!